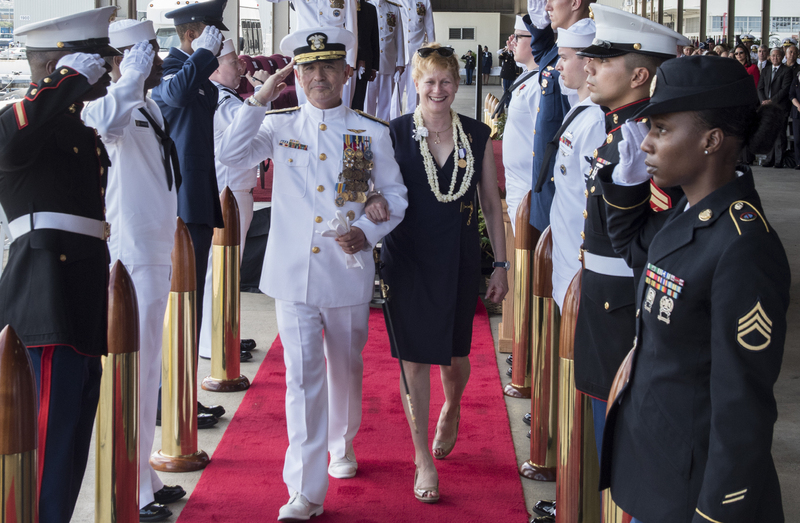 While in Hawaii celebrating a change of U.S. military leadership in the Pacific, top Pentagon officials stood in the spotlight told other regional powers that U.S. focus on this part of the world hasn’t wavered but sharpened. “For every state, sovereignty is respected no matter its size, and it’s a region open to investment and free, fair and reciprocal trade not bound by any nation’s predatory economics or threat of coercion. For the Indo-Pacific has many belts, many roads,” Secretary of Defense James Mattis said making reference to China’s One Belt One Road Initiative which seeks to place China at the center of Eurasian trade connectivity and cooperation. 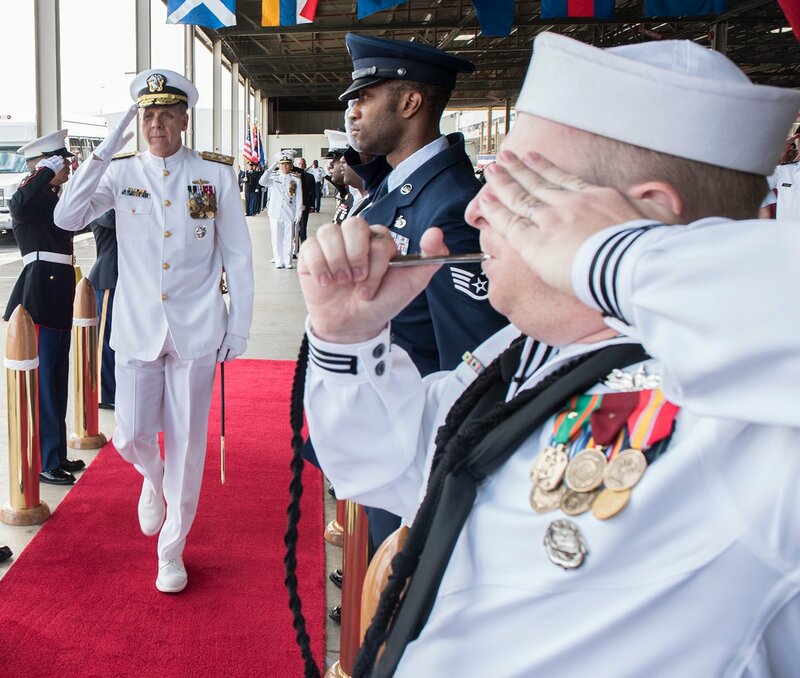 “Further, in recognition of the increasing connectivity, the Indian and Pacific Oceans, today we rename the U.S. Pacific Command to U.S. Indo-Pacific Command. Over many decades, this command has repeatedly adapted to changing circumstance, and today carries that legacy forward as America focuses west,” Mattis said. 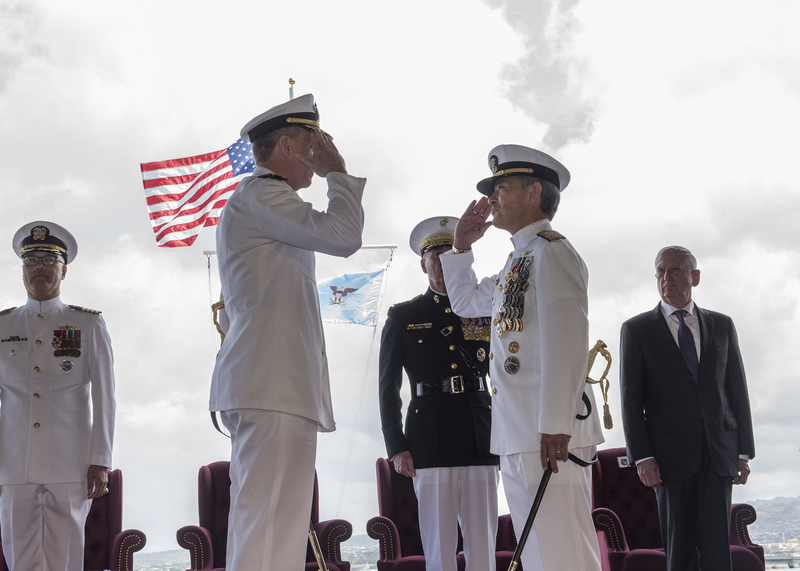 Commanding the newly-named Indo-Pacific Command is now Adm. Phil Davidson, who formally took the helm during the change of command ceremony Wednesday at Joint Base Pearl Harbor-Hickam, Hawaii. Davidson is now the military commander in charge of all U.S. forces in an operational area that covers close to half the planet. Davidson, a 1982 graduate of the U.S. Naval Academy, arrived at Indo-Pacific Command from having been the commander of U.S. Fleet Forces Command. Following last year’s spate of fatal collisions between U.S. destroyers and commercial ships, Davidson was tapped by Chief of Naval Operations Adm. John Richardson to conduct a review of the Navy’s surface operations. The resulting Comprehensive Review evaluated the entire surface fleet and focused on the Pacific where the incidents occurred. “The National Defense Strategy clearly recognizes the central challenge to our prosperity and security is the reemergence of strategic competition by revisionists powers,” Davidson said. “Four of the five principal challenges in that strategy, are found in this theater and the fifth, Iran, has previously operated in the region in just the last few years. Davidson relieves Adm. Harry Harris, a 1978 graduate of the U.S. Naval Academy. Harris is retiring from the Navy but is expected to remain working in the region as an ambassador In February, Harris had been nominated to become the U.S. ambassador to Australia, but now according to media reports, is set to be Trump’s pick to be U.S. ambassador to the Republic of Korea. Harris has to first be formally nominated and then confirmed by the U.S. Senate before becoming an ambassador. “North Korea remains our most imminent threat and a nuclear-capable North Korea, with missiles that can reach the United States, is unacceptable,” Harris said in his speech. China remains the biggest long-term challenge, while Russia still represents an existential threat to the U.S., Harris said. A lot in the world has changed since the end of the Soviet Union, and much of the change has been good, but the threat remains, he said.